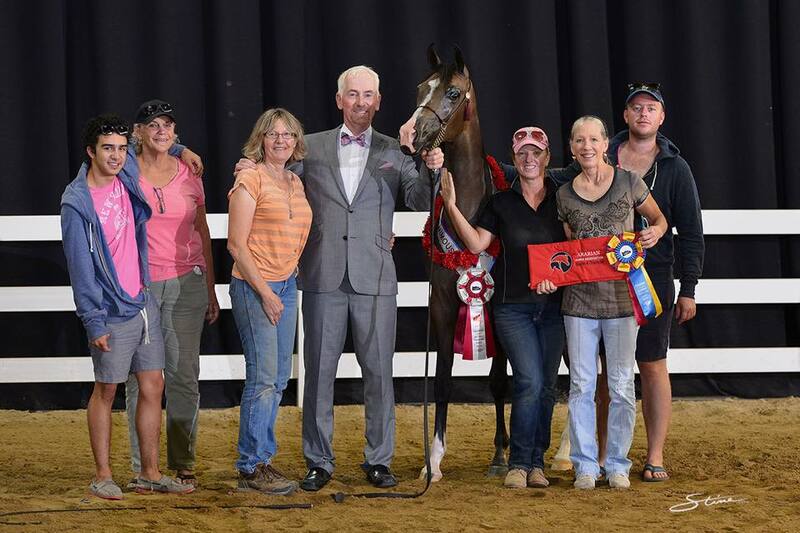 Madison MF, unanimous Champion Arabian Yearling Filly, Region IV, 2015. Photo by Stine. 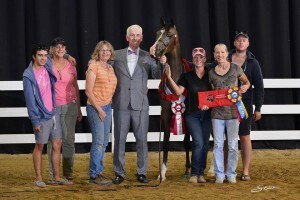 Madison MF ( Maddox Van Ryad x Benraz Magnifique by Echo Magnifficoo) was the unanimous Region IV Champion Arabian Yearling Filly on Saturday, June 27. She was also Champion Arabian Yearling Filly Breeders Sweepstakes on Friday. Beautifully trained and conditioned by Tara Boresek, she was shown to both wins by Mike Hartman. Thanks to everyone who helped make this happen. This entry was posted in Uncategorized on June 28, 2015 by Anita Enander. It is with great sadness that we acknowledge the loss of the exceptional Romantykk. The most beloved mare at Maplewood, Romantykk graced us with her charm, dynamic presence, and kind nature for 17 years. Her classic breed type, dramatic movements, and ability to produce these traits helped us to define our vision for the ultimate Polish Arabian mare. The dam of Roscoe Divine and Rapachini, she was the most talented mare we have owned. Her hackney-like trot including extreme hock action translated into serious motion for subsequent generations. This mare was well over 15 hands and had incredible presence. Her dam, BOH Romance, was Maplewood’s premier broodmare for many years and was considered by many to be the most beautiful daughter of Negatraz. An aristocrat dam of champions, her best produce include US Top Ten Revelry, Regional Top Five Rockette MF, Western Pleasure Champion ATouch Of Romance, halter champion Rebok and our precious broodmares Revlon MF and Nina Ricci MF. Romantykk’s sire, Europejczik, is a Polish National Champion Stallion and an undefeated Triple Crown winner on the Polish track. Considered the best son of US National Champion El Paso and Polish National Champion Europa (full sister to Eukaliptus), Europejczyk is the sire of numerous international halter and performance champions. Her passing marks the loss of not only our most talented broodmare, but also the foal we were most excited about, the treasured Erykk MF filly she was carrying. For those who knew and loved Romantykk, her passing was a tremendous loss. We look forward to procuring this valuable blood in future generations through her maternal sister Nina Ricci MF. This entry was posted in Uncategorized and tagged mare on October 15, 2013 by Anita Enander. Retired from production after giving us our replacement mare Rhegan MF, Maplewood decided to sell this rare daughter of *El Paso when we couldn’t get her in foal again. Revlon MF is proudly owned, loved, ridden, and enjoyed by Rhoda and Catrina Bazen. This entry was posted in Uncategorized and tagged progeny on October 15, 2013 by Anita Enander. This entry was posted in Uncategorized on October 15, 2013 by Anita Enander. 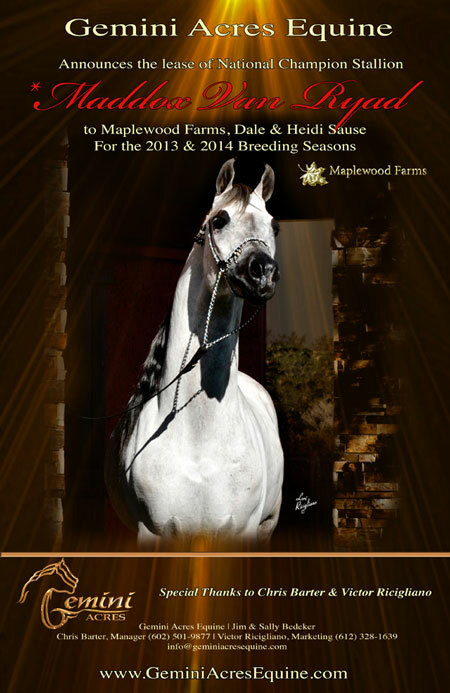 Oregon Futurity Reserve Champion and sire of multi-champion Rockette MF. The stunning colt Ex Parte MF is the only full sibling to Erykk MF and was originally purchased by Guy Benefield.